The D.C. area is going all out with watch parties, swag and great food and drink specials for the Capitals' run in the Stanley Cup Final. 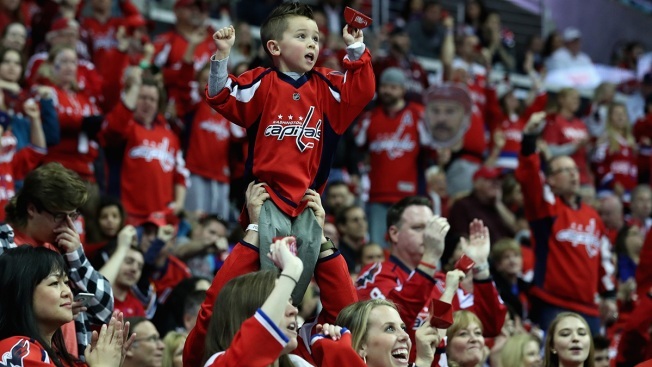 Tickets for the Capital One Arena Watch Party for the pivotal Game 5 were snapped up quickly, but there's plenty more fun to be had. The Caps are showing home games on a large screen outside Capital One Arena as part of the team's #ALLCAPS festival. Fans can watch the game from the big board above the McDonald's. Stake out a spot along 8th or G streets NW, officials say. There will additional screens on the street. The Navy Memorial will replace its scheduled outdoor movie with a live screening of Game 5. The Navy Memorial's plaza is located at 701 Pennsylvania Ave. NW. Catch the Caps game outside Nats Park. The Bullpen will open its gates at 7 p.m. for a Game 5 watch party. Guests must be over 21 after 9 p.m., and don't forget to bring a chair. Cheer on the Caps -- on the waterfront! The Wharf will project the game on it's jumbo screen on Pearl Street. Grab your blankets and lawn chairs, and head to National Harbor to watch Game 5 at 8 p.m. You'll get to watch what's sure to be an incredible game while taking in the beautiful views. Watch Game 5 at 8 p.m. on the big screen and under the lights at Bethesda Lane with food from Mamma Lucia starting at 6 p.m. The bar's website promises food and drink specials for every game. Three blocks away from Capital One Arena, you can grab $5 DC Brau brews during Stanley Cup Final games. Plus, Penn Social's happy hour runs daily from 4 p.m. to 7 p.m. Dirty Habit has indoor and outdoor screens and a special Wilson Punch for $6, with $1 from each glass benefiting the Monumental Sports & Entertainment Foundation. Another benefit: It's just blocks away from Capital One Arena. Organizers promise six screens showing the Capitals along with food and drink specials. Munch on half-price appetizers and wash it down with $2.50 Budweiser, Miller and Coors or $4 Oliver Brewing Company beers. Some appetizers will be priced at $5. Don't forget to rock the red! Brew Republic is offering an extended food happy hour and $2.50 select craft beers until 9 p.m. They promise the sound will be on for the games! Watch the game on a projector in the beer garden or on TV inside. Either way, Port City is extending happy hour until the end of the game! Rock the red and get $4 3 Star Brewing draft beers and half-priced nachos at 7 p.m. Grab a drink in the beer garden and watch Game 5 on the big screen. The Brixton has their sound on for the game and happy hour starts at 5 p.m.
Mintwood Place in Adams Morgan is playing the game and extending happy hour all night long with draft beers and house wine at $5. Cheer on the Caps all night long with all night long happy hour. Drink up with $5 beers and cocktails. As part of their Stanley Cup watch parties, Shaw’s Tavern is playing the game with sound and offering happy hour drink specials with $4 draft beers and $3 Miller Lite. The historic Georgetown tavern is showing the historic Game 5 on the big screen with sound on. Whether it’s a win or a loss tonight, hit up the all night happy hour at Toro Toro until they close at 2 a.m.
Rock the red at the viewing party and score on drink specials and $.75 wings. The coffee and donut chain is running a "Caps Win, You Win" offer through the end of the Stanley Cup Final. You can get a free medium iced coffee (excluding cold brew) the day after a Caps victory, at participating Dunkin' Donuts locations throughout D.C. Note: The offer isn't available on mobile app orders. When the Caps win in the playoffs, you can get 50 percent off your online order. Use promo code CAPS50 at PapaJohns.com.